Bank compliant check printing, with Wi-Fi, Copy and Scan! Print high-quality bank compliant checks, photos, images, barcodes and other security information! Features Wi-Fi, Print, Scan, and Copy at a very low price! 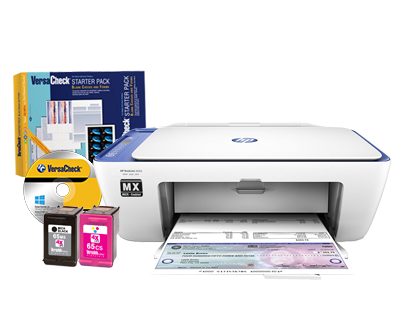 *With $400 min purchase of any combination of software, toner, ink and paper. Limit: 1 FREE printer/All-In-One per purchase. 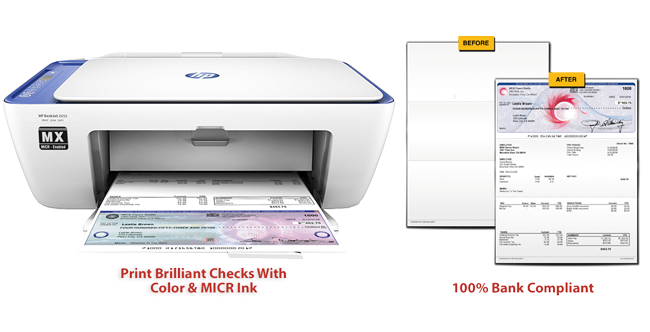 The HP 2655MX lets you print full color checks and documents with bank compliant Magnetic Ink Character Recognition (MICR) ink. Easy-to-use, this printer saves you 50-80% or more vs. buying pre-printed checks from banks and mail-order suppliers and is equally able to handle all your everyday document printing, copying, and scanning. Check printing with the 2655MX is 100% bank compliant with MICR enabled VersaInk™ cartridges. You can print directly from your desktop or any network connected PC via built-in Wi-Fi networking connectivity. *VersaCheck Presto requires use of VersaCheck checks. Supported operating systems Printer drivers included for: Windows® 10, Windows® 8, Windows® 7, Windows® Vista. Financial account validation available through VersaCheckPay.com - allow 1-5 days to process. Printer compatible operating systems: Microsoft® Windows® 10, Windows® 8, Windows® 7. Apple® OS X v10.12 Sierra, OS X v10.11 El Capitan, OS X v10.10 Yosemite.